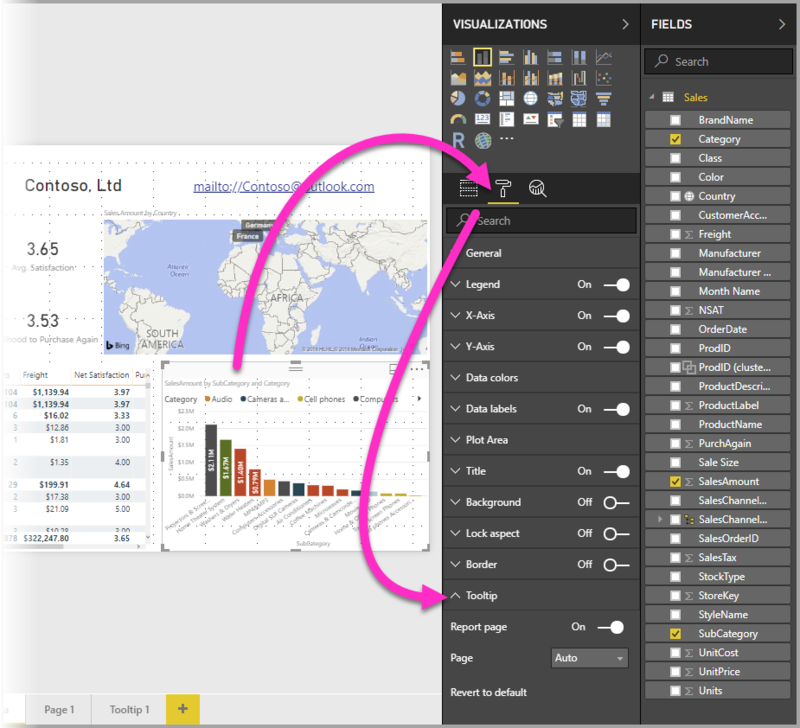 You can create visually rich report tooltips that appear when you hover over visuals, based on report pages you create in Power BI Desktop. By creating a report page that serves as your tooltip, your custom tooltips can include visuals, images, and any other collection of items you create in the report page. You can create as many tooltip pages as you want. Each tooltip page can be associated with one or more fields in your report, so that when you hover over a visual that includes the selected field, the tooltip you created on your tooltip page appears when you hover over the visual, filtered by the datapoint over which your mouse is hovering. There are all sorts of interesting things you can do with report tooltips. Let's take a look at how to create tooltips and what you must do to configure them. 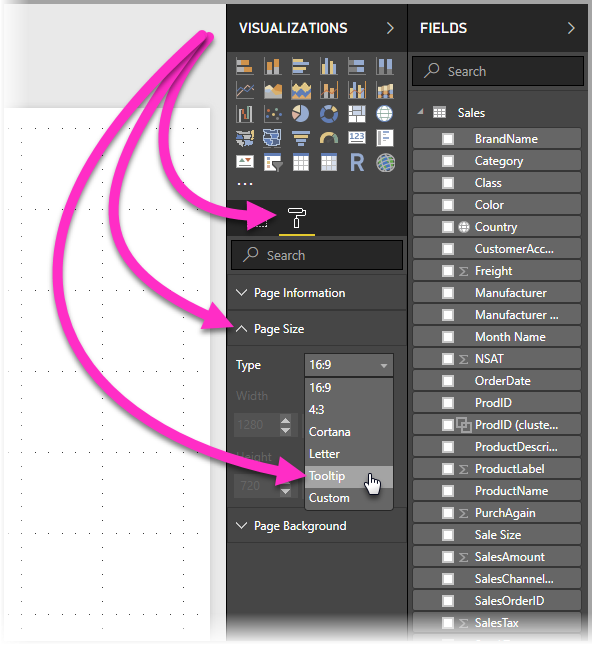 To get started, create a new report page by clicking the + button, found along the bottom of the Power BI Desktop canvas, in the page tabs area. The button is located beside the last page in the report. Your tooltip can be any size, but keep in mind that tooltips hover over the report canvas, so you might want to keep them reasonably small. In the Format pane in the Page Size card, you can see a new page size template called Tooltip. 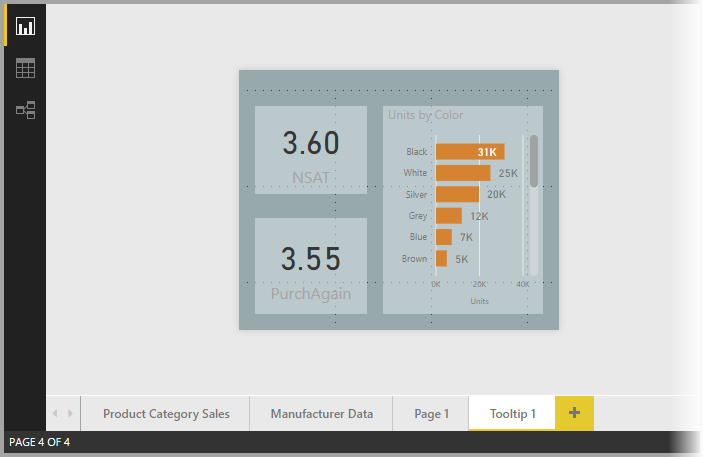 This provides a report page canvas size that's ready for your tooltip. 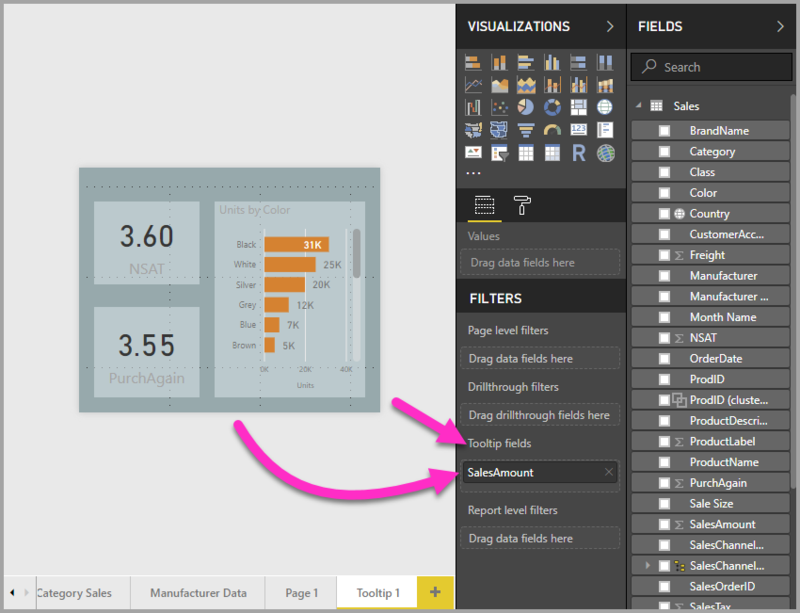 By default, Power BI Desktop fits your report canvas to the available space on the page. Often that's good, but not in the case of tooltips. To get a better sense and view of what your tooltip will look like when you're done, you can change the Page View to actual size. To do that, select the View tab from the ribbon. From there, select Page View > Actual Size, as shown in the following image. You can also name the report page so its purpose is clear. Just select the Page Information card in the Format pane, then type the name into the Name field you find there. In the following image the tooltip report name is Tooltip 1, but feel free to name yours something more inspired. From there, you can create whatever visuals you would like to show up in your tooltip. In the following image, there are two cards and one clustered bar chart on the tooltip page, along with a background color for the page itself, and backgrounds for each of the visuals, to give it the look we wanted. There are more steps to complete before your tooltip report page is ready to work as a tooltip. You need to configure the tooltip page in a few ways, as described in the next section. 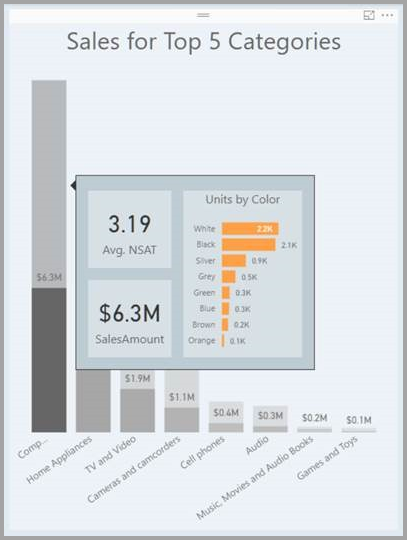 Once you have the tooltip report page created, you need to configure the page in order for Power BI Desktop to register it as a tooltip, and to ensure it appears in over the right visuals. To begin with, you need to turn the Tooltip slider to On, in the Page Information card, to make the page a tooltip. Once that slider is set to on, you specify the fields for which you want the report tooltip to appear. For visuals in the report that include the field you specify, the tooltip will appear. You specify which field or fields apply by dragging them into the Tooltip fields bucket, found in the Fields section of the Visualizations pane. In the following image, the SalesAmount field has been dragged into the Tooltips fields bucket. You can include both categorical and numerical fields in the Tooltips fields bucket, including measures. 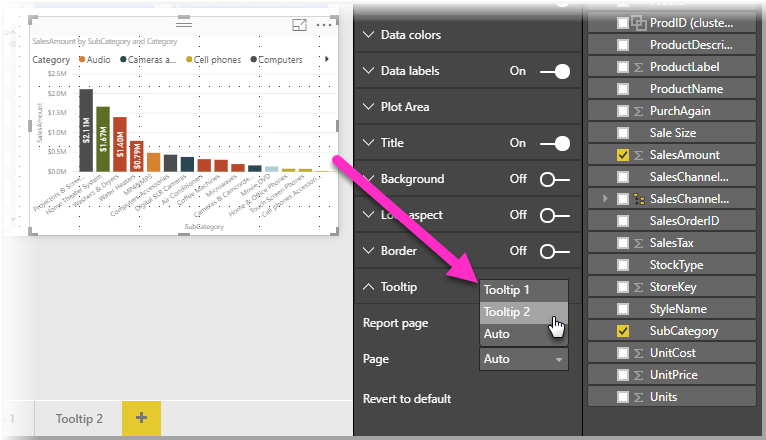 Once completed, the tooltip report page you created will be used as a tooltip in visuals in the report that use any fields you placed into the Tooltips fields bucket, replacing the default Power BI tooltip. In addition to creating a tooltip that automatically appears when hovering over a visual that contains the specified field, you can manually set a tooltip. Any visual that supports report tooltips now has a Tooltip card in its Formatting pane. To set a tooltip manually, select the visual for which you want to specify the manual tooltip, then in the Visualizations pane, select the Format section and expand the Tooltip card. Then, in the Page dropdown, select the tooltip page you want to use for the selected visual. Note that only report pages that are specified as Tooltip pages show up in the dialog. Being able to manually set a tooltip has many uses. 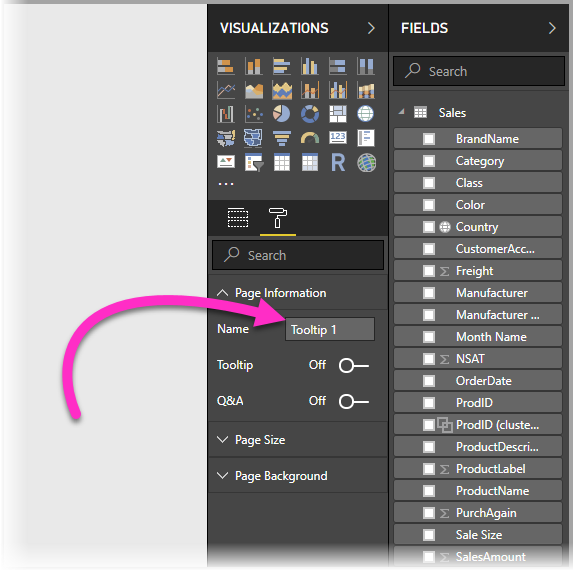 You can set a blank page for a tooltip, and thereby override the default Power BI tooltip selection. 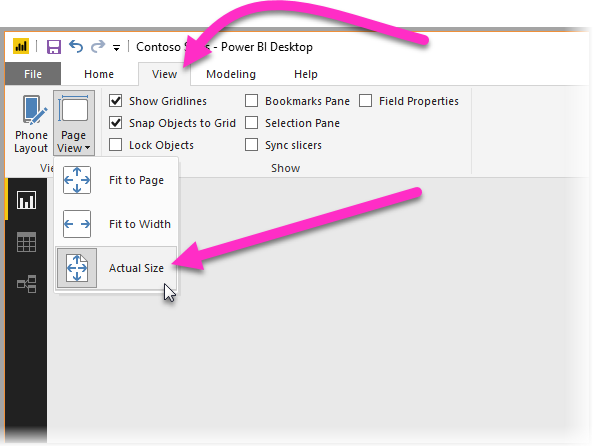 Another use is when you don't want the tooltip that is automatically selected by Power BI to be the tooltip. 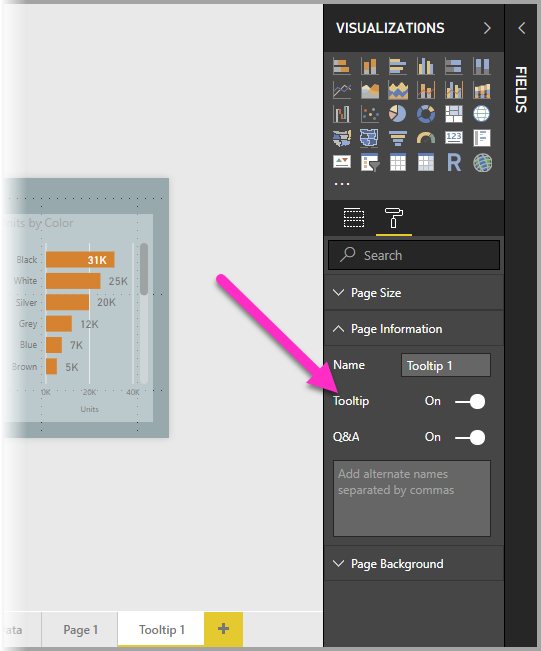 For example, if you have a visual that includes two fields, and both of those fields have an associated tooltip, Power BI selects only one to show. You might not want that to be the case, so you could manually select which tooltip should be displayed. 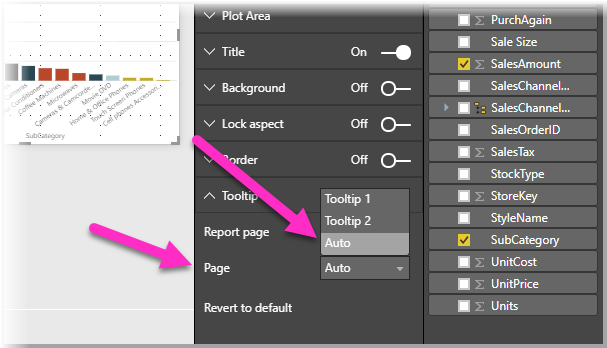 If you create a manual tooltip for a visual but decide you want the default tooltip instead, you can always return to the default tooltip that Power BI provides. To do so, when a visual is selected and the Tooltip card is expanded, just select Auto from the Page dropdown to go back to the default. There are a few considerations to keep in mind when your report tooltips are interacting with line chart visuals, and with visuals when cross-highlighting. When a report tooltip is displayed for a line chart, only one tooltip for all lines in the chart is displayed. This is similar to the default tooltip behavior for line charts, which also displays only one tooltip. This is because the field in the legend does not get passed through as a filter for the tooltip. In the following image, the tooltip being displayed is showing all units sold on that day across all three classes displayed in the report tooltip (in this example, Deluxe, Economy, and Regular). When a visual is being cross-highlighted in a report, report tooltips always show the cross-highlighted data, even if you're hovering over the faded section of the data point. In the following image, the mouse is hovering over the faded section of the bar graph (the section that is not highlighted), but the report tooltip still shows data for the highlighted portion of that datapoint (the highlighted data). There are a few limitations and considerations for tooltips to keep in mind. 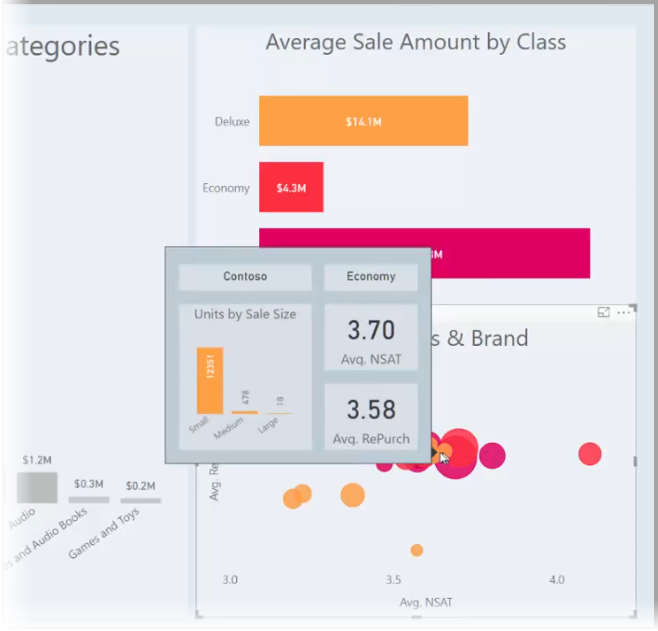 Beginning with the December 2018 release of Power BI Desktop, Button visuals also support tooltips. Report tooltips are not supported when viewing reports in mobile apps. Report tooltips are not supported for custom visuals. Clusters are not currently supported as fields that can be shown in report tooltips. When choosing a field to be shown for report tooltips, when using a field versus a category, visuals that contain that field will only show the specified tooltip when summarization with the selected field matches.